There were Easter commemorations in Britain, US and Australia, but the most colourful events took place at home, particularly in Dublin, where thousands took part in pageantry. Scores of actors dressed in period costume, and a part of Dublin city centre was briefly transformed into an Edwardian streetscape. Sinn Fein in Dublin worked with historical society volunteers to recreate famous 1916 events such as the ‘O’Rahilly Charge’ on Moore Street, and the formal surrender by General Padraig Pearse. 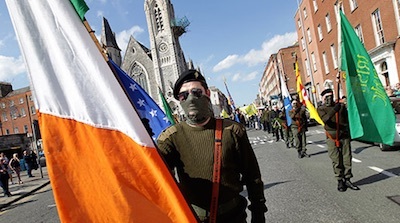 Sinn Fein Deputy President Mary Lou McDonald TD delivered the keynote address at the party’s Easter Sunday rally at the GPO, and also took part in a ‘military inspection’ of dozens of ‘troops’ dressed in traditional war of independence garb. 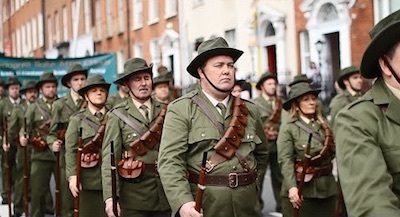 The official 26-County State commemoration took place in Dublin on Easter Sunday. President Michael D Higgins led the events which culminated in four Air Corps planes flying over O’Connell Street. Higgins laid a wreath outside the GPO in remembrance of those who died during Easter week 1916 and the Proclamation was read by a member of the 26-County Army. A ‘Road to the Rising’ commemorative event was held by the state in Dublin on Monday, and was popular with both tourists and locals alike. Part of O’Connell Street was converted to an Edwardian thoroughfare, evoking the atmosphere of the capital before 1916. Relatives of those who fought in the Easter Rising held their own special remembrance ceremony in Dublin city centre. The 1916 Relatives’ Association said the service is being held to pay tribute to all those who took part in the events leading up to the Rising, and not just those who signed the Proclamation. Hundreds of people attended the wreath-laying ceremony, which took place at the Garden of Remembrance on Parnell Square. Sinn Fein’s North Belfast representative Gerry Kelly addressed the crowd gathered for his party’s Belfast Easter Commemoration. “Republicans are moving Irish society closer to the principles contained in the 1916 Proclamation every day,” he said. “Easter week 1916 inspired generations of Irish Republicans but also peoples throughout the world who rose up against the tyranny of colonial rule, imperialism and oppression. Kelly also spoke at a separate commemoration in north Belfast, where he paid tribute to republicans who died during the conflict. “We are in the countdown to a united Ireland,” he told the crowd. Sinn Fein’s candidate in next month’s Westminster General Election, Gearoid O hEara, spoke at the party’s 1916 Easter Rising commemoration in Derry city cemetery. Among those present were Deputy First Minister Martin McGuinness, party Assembly members and councillors. “Sinn Fein ministers are fighting to protect frontline services in Stormont from the worst of the Tory cuts and we pledge to continue this,” Mr O hEara said. 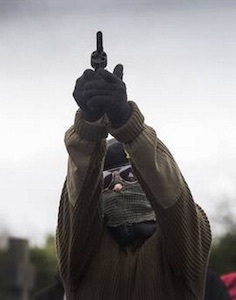 There was a more militaristic tone in Lurgan, where a volunteer from the Armagh brigade of the Continuity IRA fired a volley of shots over the Republican plot at St Colmans Graveyard at the Easter commemoration on Saturday. A military colour party also took part in the short parade before taking up position at the cemetery’s republican plot. During the event a masked man appeared and fired three shots over the grave using a handgun. A message was read out in the name of the leadership of the republican movement. “Time after time we have seen that treating with the English government and compromise on the basis principles of Irish national independence has afforded the enemy a platform to develop new and more robust political, economic and military barriers to freedom,” the statement said. Republican Sinn Fein representative Roisin Hayden, who spoke at the event, urged republicans to prepare for the centenary of the 1916 Rising. “As we leave here today let us remember those who have fought and died for the all-Ireland republic and to who we owe a debt of gratitude,” she said. Republican Sinn Fein also held other commemorations across the north at the weekend. One of the party’s main events took place in Derry’s city cemetery on Sunday after wreaths had earlier been laid at the graves of republicans in Loup and Dungiven by veteran Mickey McGonigle. Activists of the Irish Republican Prisoners’ Welfare Association organised various activities and events throughout Ireland. On Friday, Belfast IRPWA held a successful picket and distributed information in the Dunville Park area of the Falls Road in order to highlight the ongoing abuse of Republican Prisoners in Maghaberry. In addition, a number of Scottish activists undertook a sponsored cycle from Glasgow to Belfast. On Saturday, Dublin IRPWA activists organised a tour of Dublin’s South Inner City’s involvement in the 1916 Easter Rising. On Easter Sunday, Lurgan IRPWA along with local Republicans activists were to the fore in the organisation of the local Easter Commemoration. A wreath was laid on behalf of the IRPWA and IRPWA spokesperson and activist Mandy Duffy chaired proceedings while Belfast IRPWA activist Dee Fennell gave the main oration. 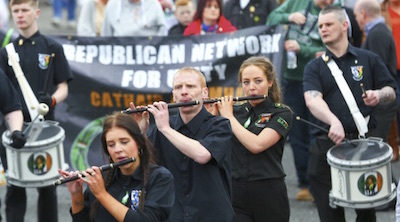 Several hundred people, including leading members of the 32 County Sovereignty Movement, the IRSP, the IRPWA and Republican Sinn Fein, attended the march and commemoration organised by the 1916 National Commemoration Committee on Easter Monday in Derry. The PSNI maintained a low profile but informed marchers by loud speaker and by notices on their Land Rovers that they were taking part in an illegal parade. The march was led by a 10-man colour party, dressed in military-style uniform and accompanied by a flute band. Wreaths were laid at Derry’s republican monument on behalf of the (new) IRA and the Derry brigade of the INLA, among other groups. Mr Donnelly, an independent member of Derry City and Strabane council, told those present that republicans were united in failure. A leading member of the 32 County Sovereignty Movement, Mr Donnelly said a “national conversation” about republicanism’s message was needed in the approach to the centenary of the 1916 Easter Rising. “The fragmented nature of the republican base at present is testament to the fact that we have lost this ability to communicate. We cannot advance with a parochial mind-set,” he said. 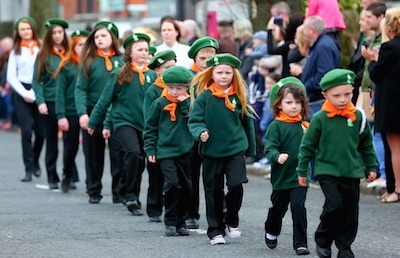 One of the largest Easter commemorations was in Carrickmore, where an estimated 2,000 republicans were in attendance for an independent event organised by Tyrone National Graves Association. Descendants of Fenian leader Jeremiah O’Donovan Rossa were among those who took part in the rally, which was addressed by Tyrone socialist republican Tommy McKearney. Brian Cawley, chairman of Tyrone National Graves Association, paid tribute to dead republicans during the commemoration. “Tyrone National Graves has a long and proud history of organising this commemoration, for many years,” he said. “We salute the courage and bravery of those who have died for Irish freedom across this county and elsewhere. Several hundred people gathered in County Derry last weekend to remember former INLA leader Dominic McGlinchey and his wife Mary. McGlinchey was shot dead in February 1994 in Drogheda, County Louth, while his wife was killed in January 1987 in Dundalk. Several bands paraded through Bellaghy to the graveside of the couple who are buried close to former IRA hunger strikers Francis Hughes and Thomas McElwee. The couple’s son Declan spoke about the symbolism of the Easter Lily, which republicans wear to remember their dead. “I see it a symbol for all those dedicated their lives to the republican struggle,” he said. “People who provided the safe houses and logistical support to the volunteers on the ground. Wreaths were laid on behalf of the IRSP, INLA and Republican Sinn Fein. After the parade independent Donegal TD Thomas Pringle spoke at a memorial lecture on the human rights of republican prisoners. The National 1916 Commemoration Committee also held a march in Dublin from the Garden Of Remembrance to the GPO and then onto Arbour Hill on Easter Monday. A similar march was organised by the 1916 Societies in Dublin on Easter Saturday, its inaugural Easter parade. The James Connolly 1916 Society in Monaghan also held separate independent Republican Commemorations for Volunteers Lawrence McNally, Jim Lynagh and Sean McKenna on Easter Saturday. Eirigi held a well-attended Easter commemoration parade in Dublin behind a Glasgow marching band, marching to Moore Street and the GPO on Easter Saturday. Cathaoirleach eirigi Brian Leeson delivered a short oration before a rendition of Amhran na bhFiann was played. There was a large turnout in Duleek on Good Friday for the annual Independent Easter commemoration hosted by Duleek 1916-1981 Monument Committee. Wreaths were laid in memory of all those who sacrificed their lives for the cause of Irish freedom including Vol Joe Coombes, Vol Noel Gallagher and Vol Harry McCormick. The Monument Committee Easter statement was delivered by Ex-POW Tommy Gallagher and the main speech by Ex-POW Anthony McIntyre. Dave McSweeney read the proclamation. The monument committee statement particularly highlighted the comparisons between the injustices in the 70’s and those of the current era, and appealed to those present to join the campaign to get the Craigavon Two released. The Republican Network for Unity gathered in Counties Antrim, Derry, Down, Louth, Wexford, Dublin and elsewhere to play their part in “principled Republican commemorations” of all those who have given their lives for Irish Freedom and the revolutionary ideal. RNU in Dublin held their annual Elizabeth O’ Farrell/ Easter Ceremony on Monday 6th of April. Led by a colour party, those assembled including RNU activists from Cork and Dundalk and many independent Republicans heard Ex-Pow and political activist Declan Carroll chair the event and give the main oration. Organisers say that up to 300 people attended a Republican Network for Unity event in north Belfast on Saturday. The annual event commemorates members of Na Fianna Eireann from the area who died during the Troubles. South Down representative Andreas O’Cluaid said it was important to stick to the original ideals of the proclamation. “We also note with alarm the Orwellian attempts of the Free State and other elements to rewrite the 1916 proclamation, to rebrand Irish republicanism as something it has never been,” he said.